We welcome Wendy Lewis as a guest contributor this week. Wendy talks about the challenges of sustaining an enhanced recovery colorectal pathway, based on her experiences as a ward manager at the Wirral Hospital. We followed all the advice for implementing enhanced recovery that was available in 2006. We had a 3-pronged leadership approach from a surgeon, an anaesthetist, and a nurse. This was supported by a motivated team who were all “on board” and enthusiastic to improve the pathway. We gained agreement for the programme from all of our stakeholders and by September 2007 we were good to go! Implementation was uneventful. The initial patients did well, any glitches were identified and addressed, and we had a simple data collection process measuring our outcomes. As the Ward Manager I was in the ideal position to lead the programme from the patient bedside, providing teaching and leadership to all staff involved in treating patients on the new pathway. I acted as an educator, role model, change agent and, most importantly ensured that compliance to the programme was maintained for every patient, and was not dependent on the day of the week, which staff were on duty, or if the newly rotated SpR and junior medical team thought that Enhanced Recovery was a good idea. We had defined our method and standard of care, resourced it, and any newcomers to the team were welcomed and told “this is the way we do things here”. We were doing well! Readmissions were decreased, transfers to critical care were greatly reduced, hospital acquired infection rates were down, staff satisfaction improved and consequently involvement in the programme increased, communication across the patient pathway and between different departments improved, and most importantly, patient experience improved. Our ER Nurse secondment (an 18 month secondment afforded within our ward establishment) finished in September 08 and as planned, the running of the programme just continued as before. Our aim for this post had always been to introduce and embed the principles in daily care delivery so ER became the norm, the default position. However, length of stay started to drift upwards from March 2010 and I think that we had taken for granted that ER was embedded in our multi-disciplinary practice. We didn’t appreciate the ongoing management that was required. Length of stay continued to drift, and a review showed that our LOS was 1-day higher than the previous 6 months, and 2 days higher than our best. The numbers didn’t drift any further but the programme felt less tight, less of a priority, and required more input to ensure compliance with the individual elements. In October 2010 I did an objective review of the programme, a new baseline audit and the findings were really interesting. Compliance with the programme was there for 90% of the elements. There was non-compliance with managing patient expectation and criteria led discharge. These are probably two of the most important elements for consistently ensuring your best possible LOS. By failing to managing patient experience I mean that, if a patient attended Pre Op clinic with out a relative/friend/coach – it had become OK. If they then arrived on admission day without any provision in place for their timely discharge, that too had become OK. At the other end of the patients’ stay the nurses had stopped actively looking for criteria to be met. The most senior Consultant Surgeon left in September. This destabilised the medical team as that wealth of experience and clinical expertise was replaced by locum appointments. These 3 factors were obviously going to have an effect on results. Even individually they would have proved significant. But I believe the most important was the lack of senior leadership, “The Nag” at ward level. Had there been a permanent ward manager with a commitment to ER in place, the new nursing team would have had the structures in place to adjust to a change in its membership and been in a position to support the changes in medical team’s leadership. The lesson the Wirral learnt from this was to have an eye for the long game, beyond the implementation phase. We had followed the advice of the 3-pronged attack of leadership. Now the advice is that a successful and sustainable programme also has executive support and Primary Care engagement. We thought that having the principles embedded in practice would always give the results we got at the start. We were wrong. 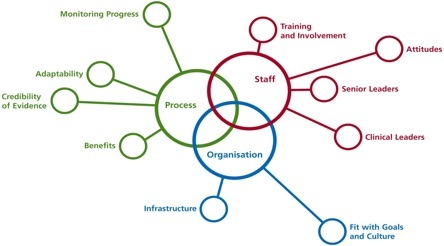 If we look at the NHS Institute’s sustainability model, we hadn’t addressed the factors beyond the ward doors, beyond our motivated clinical team. We’ve since used the sustainability model and it has been invaluable in helping us to understand what the real barriers were to sustaining our pathway. What next for Wirral? Well in December 2010 the leadership at ward level was restored and this is already getting our results back on track. Medical staffing is stable and these two components are supporting each other with ER. The wider organisation has also become involved, a vital component of sustainability. Wendy Lewis has been a Service Improvement Manager for the Enhanced Recovery Partnership Programme, at the Department of Health over the last year. She is now Service Improvement Lead at the Wirral University Teaching Hospital.